Change the background color, size of text, and color of grid. 1. 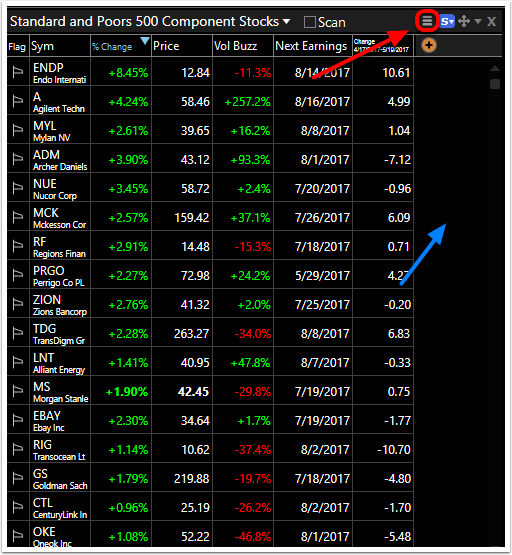 Click on the menu icon in the top right corner of the Watchlist window. You can also right click on a blank area in the watchlist (Blue Arrow) to access the Watchlist Properties menu. 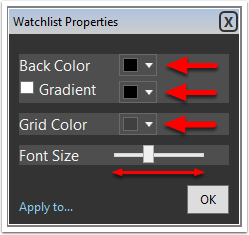 Click Apply to...to apply the changes to a) all WatchLists in the current layout; b) all WatchLists currently in the program; c) all new WatchList windows opened. 4. Once you make your desired changes, click OK. Selecting Apply to... allows you to apply your specified settings to all WatchLists in your current layout, All WatchLists in your system, or make it the default settings for any new watchlist or EasyScan created.